The hefty Xtreme is all-around great with a large end cap engineered especially for repairing punctures in heavy duty tubeless tires. Like the other Pro series tools, the Xtreme kit includes tool, 8 repair plugs, 3 insertion tubes, 1 air stopper, 1 clearing attachment and 1 pipe cleaner = 15 items. The Pro Xtreme AL weighs 4 ounces, so still light weight with a large-surface end cap that can be an advantage. Extra features are storage slots machined in the tool body and replaceable insertion tubes. All Dynaplug tools come with the manufacturer's LIMITED LIFETIME warranty. The Dynaplug solution is designed to repair a punctured tire in just a few minutes without taking the tire off the wheel. Remove the puncture, align the plug, push and pull. You don't need anything more than the tool and the repair plug to permanently seal the puncture hole from the inside out without compromising the tire balance. One plug usually seals a puncture from an object like a nail, screw or staple the size of a 16D 3½"" long nail. An additional plug can be added as necessary. 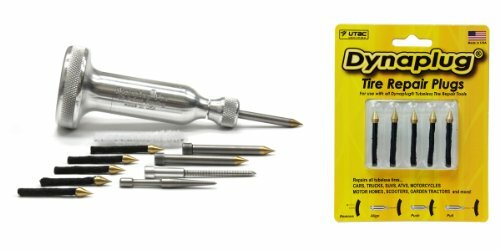 Dynaplug repairs punctures in tires for cars, trucks, motorcycles, scooters, campers, motor homes, RVs, garden tractors and more. IN ADDITION, Dynaplug is compatible with run flats and tires with pressure monitoring sensors. Add Dynaplug to your other vehicle repair tools and save time and money with a solution you can use with confidence. Visit Dynaplug on YouTube for how-to-videos. Comes with good instructions. Dynaplug provides fast, reliable and friendly support. Proudly designed and manufactured in the USA! ABOUT: five machined compartments that store extra insertion tubes, air stopper, and clearing tool. Billet 6061 Aluminum. Made in USA. INCLUDED IN THIS DEAL: (1) Dynaplug tool, (8) repair plugs, (3) insertion tubes, (1) air stopper, (1) clearing attachment, (1) pipe cleaner, and (1) extra repair plug 5-pack. Limited Lifetime Warranty. DIMENSIONS: Is just 5.6 x 4.1 x 2.7 inches and weighs 6.4 oz.